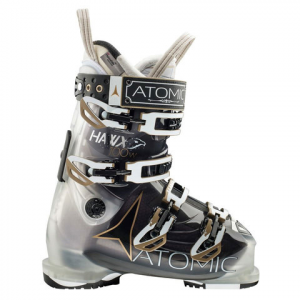 For the Advanced All Mountain Woman Skier, the Atmoic Hawx 100 Boot will help you conquer any piste on the mountain. With Memory Fit Technology and a custom tailored cuff and shell, this boot is specific to the woman's foot and can be personalized for optimal comfort. Lined with the Gold Liner, it's lightweight and warm due to 3M Thinsulate Insulation. The Sole Flex allows for enhanced balance while WTR Grip Pads made for easy walking. Finally, Hawx has include Power Shift so that you can adjust your Forward Lean, and get the stiffness you desire.